At long last, Detroit is getting some girl power: automaker General Motors GM -1.22% has named its first female CEO, the company announced Tuesday morning. Mary Barra, the company’s executive vice president of global product development, purchasing and supply chain, will take over for current CEO Dan Akerson on January 15, 2014. Akerson, who has been GM’s chairman and chief executive since September 2010, had been considering a departure but decided to advance his succession plan because his wife was recently diagnosed with a late stage of cancer. “I will leave with great satisfaction in what we have accomplished, great optimism over what is ahead and great pride that we are restoring General Motors as America’s standard bearer in the global auto industry,” Akerson said in a message to employees, the company reported. 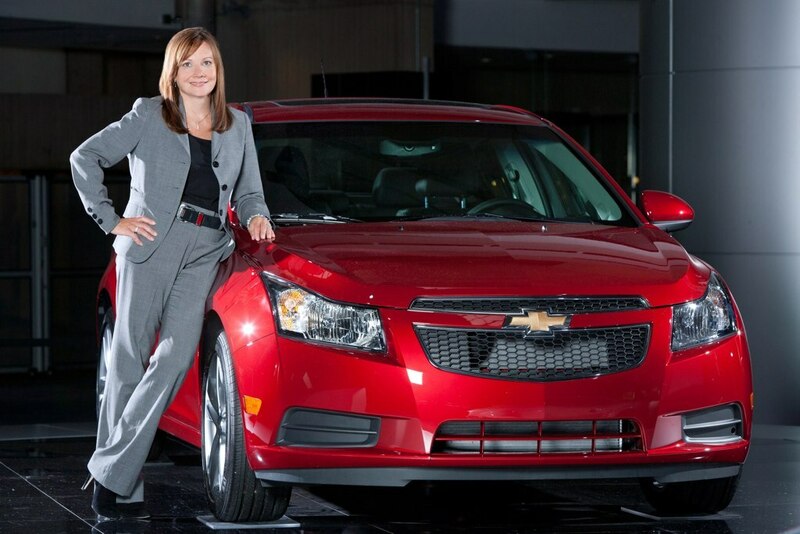 CEO-to-be Barra, who ranks 35th on FORBES’ list of most powerful women, has worked at GM for 33 years and has experience with positions in manufacturing, engineering and senior management. She began her GM career a co-op student in the Pontiac Motor Division in 1980 and gradually worked her way up the corporate ladder. In the statement announcing her new role as CEO, GM credited Barra with “revitalizing GM’s product development process,” saying that her efforts resulted in higher product quality ratings and increased customer satisfaction. Barra will also join GM’s board, though a different executive was chosen to succeed Akerson as chairman of the board: that position will go to Theodore (Tim) Solso, who is the former chairman and CEO of Cummins CMI +0.91% and has been a member of the GM Board since June 2012. Barra, Akerson and Solso’s moves were not the only ones announced Tuesday morning; GM also announced that Dan Ammann, executive vice president and chief financial officer, was named company president and will manage the company’s regional operations around the world. Mark Reuss, executive vice president and president of GM’s North America division, will replace Barra as executive vice president of global product development, purchasing and supply chain. Alan Batey, current GM senior vice president of global Chevrolet and U.S. sales and marketing, will replace Reuss as executive vice president of North America. And in a move that perhaps indicates GM’s confidence in its European operations, GM announced that Steve Girsky, vice chairman of corporate strategy, business development and global product planning, will leave the company in April of 2014. In the interim, he will move to a senior advisory role, the automaker said. Girsky played a key role in GM’s bankruptcy turnaround and has spearheaded the company’s European efforts, which the company says are back on the path to profitability thanks to Girsky’s leadership. Following news of the management changes, shares of GM opened at $40.55 per share, a shade below Monday’s closing price of $40.90.